Get ready for another round of Formula One’s “looks vs. safety” debate—if you can even call it a debate—because the FIA recently shared photos of its newest idea for cockpit protection: the shield. It’ll be tested at the British Grand Prix Friday, and the Verizon IndyCar Series is already looking at something similar. That sounds like a quick turnaround from announcement to testing, but a press release from the FIA said the goal with this idea is to “get initial feedback from drivers at the earliest possible stage of development.” There’s also the fact that F1 is already going to be at least a year late in giving drivers the head protection that most of them called for, but that’s totally a minor detail. Totally. A transparent open canopy system constructed using polycarbonate, the Shield is aimed at providing significant protection from debris, while ensuring unrestricted forward vision for the driver. A possible geometry [shown above] has been developed and the FIA is currently working with teams in Formula One on further defining its geometry. A number of indoor and outdoor tests are currently being conducted and the Federation’s target is to carry out a first full track test at Monza in September. The shield is the newest addition to a long line of attempts at head protection in F1, since drivers called for closed cockpits by 2017 after the deaths of F1 driver Jules Bianchi and IndyCar driver Justin Wilson due to head injuries sustained in crashes. But it’s already 2017, and we can still see all of their heads bobbling in the open air every race weekend. And whether you’re a big fan of tradition and “the look of the car” or not, keeping the cockpit open is far from the way to go. Drivers can’t race if their heads aren’t intact, and the racing is what we’re here to see. 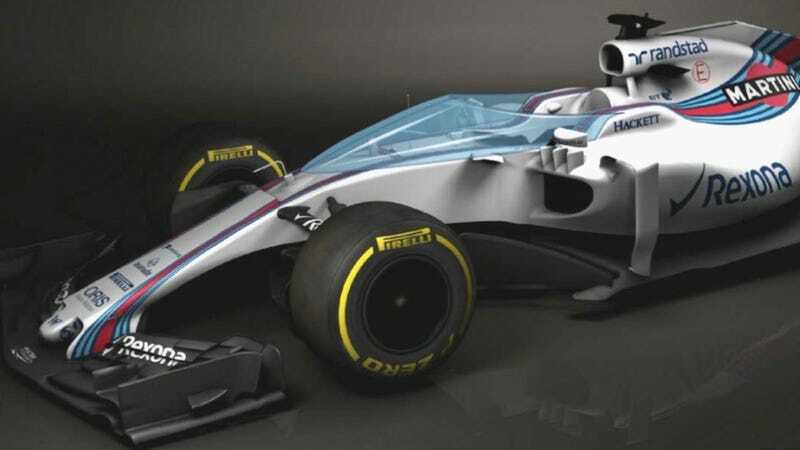 F1’s sanctioning body, the series and individual teams have tried to pitch in with the effort, testing the halo and different styles of windshields on cars. The halo, a wishbone-style bar over the cockpit, didn’t go well, with drivers complaining about visibility and three-time champion Lewis Hamilton simply calling it ugly. At the time, he said the cars were “perfectly fine” as is. Red Bull’s F1 team attempted a windshield last year, but this new style of “shield” looks exponentially better than their design. As for F1, the FIA shared just one image of the shield, low quality and cropped as you see above. Whether that’s oddly on purpose or reminiscent of the internet capabilities during the Bernie Ecclestone-era of F1, the world may never know.